Flamands Beach. Photo by Sherry Jacobson. In between drugstore hopping around the world to find the best global beauty products for her website, Travel Beauty, Alyssa Barrie Weiss makes time for island hopping around the Caribbean. St. Barts is her favorite, for so many reasons. ST. BARTS – There are special places that stand out in my mind as magical. Saint Barthélemy, better known as St. Barts, in the French West Indies, is one of them. This tropical volcanic island offers breathtaking views from its steep peaks and some of the most beautiful beaches in the world. This is a place where people to go to unwind and disconnect from their everyday lives and it's also where people go to be part of the scene and party with the rich and famous. (If you are one of them, make sure to visit Le Ti St. Barth.) Its lush scenery and old-world European ports and towns converge on one small island to create a one-of-a-kind vacation spot that remains blissfully untouched by towering hotel developments. You'll never forget where you are: The French accent is very strong around here — in every possible way. 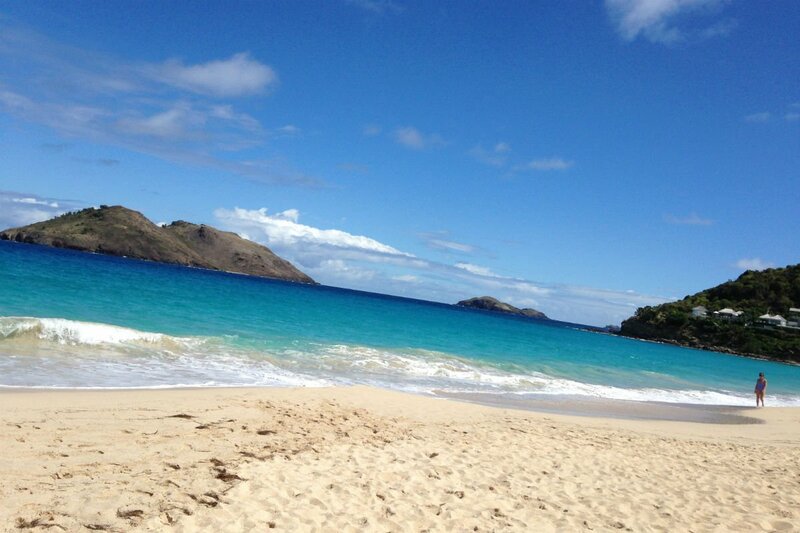 If you are in St. Barts for a day trip and short on time, head to Colombier Beach. Drive up the hill along the road parallel to Baie des Anges where you will reach a dead end. Park the car and hike 40 minutes downhill to crystal clear water and a secluded beach surrounded by jagged boulders. The hike through the tropical forest is a great workout, with lush vegetation and wildlife lining the winding path. A word to the wise: Bring sneakers and lunch. There is nothing at the beach. Of course, if it's an option, you can also have your yacht pull directly into the cove . Welcome to Saline Beach. Photo by Sherry Jacobson. Hit as many beaches as you can. 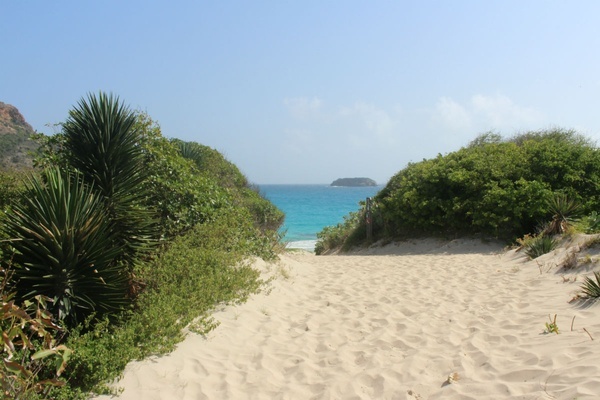 As opposed to other Caribbean islands, the beaches on St. Barts have their own personalities. These are my top picks. Gouverneur Beach: My favorite. Behind you, there's a view of the hillside, and, in front, it's all blue skies and calm, clear turquoise water that goes on and on. There are no hotels on this beach, giving it a secluded feel. Grande Saline Beach: A stunning beach of fine white sand adjacent to what used to be an old salt mine (hence the name). You won't find any hotels here either (hence the deserted island vibe). 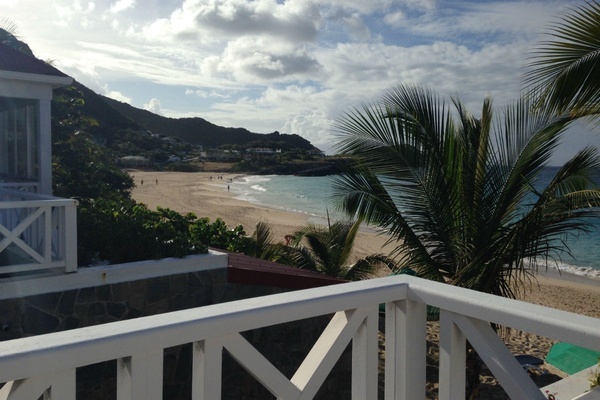 Flamands Beach: One of the most tranquil on the island, overlooking the islands beyond St. Barts. There's a lot here: the newly renovated Hotel Taïwana, villa rentals, and great restaurants. Sand Bar Restaurant. Photo courtesy of Eden Rock Hotel. 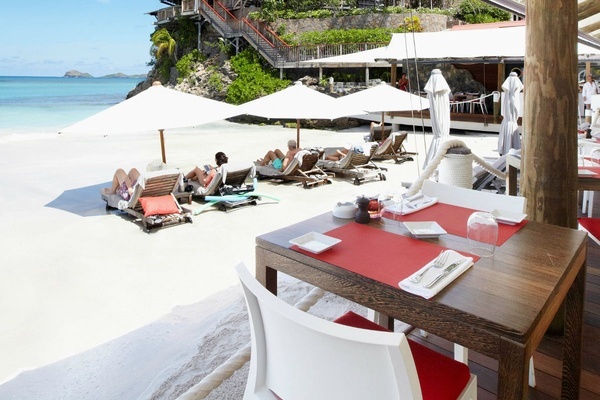 Sand Bar Restaurant at Eden Rock Hotel on St. Jean Bay serves a lovely, fresh beachfront lunch. It feels like NYC's beloved ABC Kitchen was magically transported to a tropical island. Nikki Beach on St. Jean Beach is the place to go for a party scene. The caipirinhas are fantastic. Don't worry if you have too many: That's what everyone else is doing. Le Sereno Restaurant on Grand Cul de Sac blends French, Japanese, and Peruvian cuisines prepared by talented chefs who have been mentored by Nobu Matsuhisa, Daniel Boulud, and Alain Ducasse. Bonito in Gustavia serves French and South American cuisine with fantastic views of the harbor. L'Esprit Jean-Claude Dufour is a new restaurant on Saline beach that serves delicious fresh global cuisine for lunch and dinner. L'isoletta (Rue du Roi Oscar II; +59-05-90-52-02-02) in Gustavia is the place for quick, casual lunches — great salads and pizzas — in town. La Langouste, an outdoor Creole and French restaurant at Flamand Beach Hotel (a nice beachfront hotel), is my favorite of the string of eateries on Flamands Beach. It's a must for seafood lovers — the fresh lobster is probably the best on the island. Shops along downtown St. Jean Beach. Photo by Berit Baugher. St. Barts is my absolute favorite place to shop. 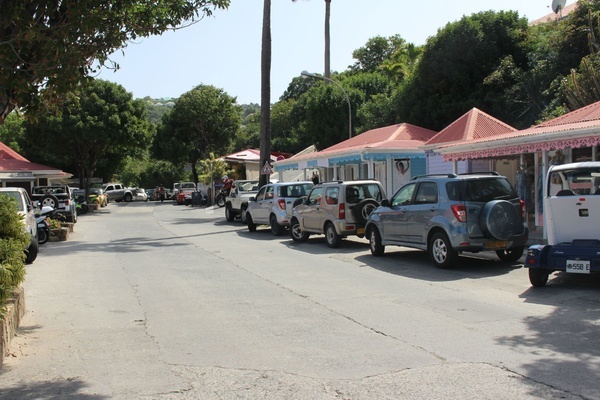 There are loads of boutiques in Gustavia, the capital and main town on the island where small French and Creole inspired villas are built into the mountain. Laurent Effel is the place I go for French couture-influenced bags, belts, and shoes. Donna Del Sol carries incredible handcrafted fine jewelry. Le Civette is a gold mine for its fantastic seletion of light cashmere, knits, and linen clothing, as well as leather shoes, accessories, and costume jewelry. La Villa Creole are a string of shops near St. Jean Beach. Iléna is great for swimsuits and lingerie. Banana Moon also has swimsuits as well as sarongs and beach footwear. Filles des Iles has the latest on-trend European fashions, including great dresses. And because I literally devote my life to Travel Beauty, I love the great French pharmacies for stocking up on French toothpaste and toothbrushes and sun care products by Institut Esthederm. Look for the pharmacie sign with the green cross sign. My favorite is Pharamcie Vaval in the Vaval Centre right across La Villa Creole. Flamands beach as seen from a villa balcony. Photo by Sherry Jacobson. Hotel Baie des Anges is a lovely hotel with luxury apartment suites with terraces overlooking Flamands Beach. Hotel Taïwana, also on Flamands Beach, recently reopened a luxury spa hotel with a new restaurant right on the beach. I like to stay in one of the many lovely cottages and villas for rent on Flamands Beach. Contact Wimco Villas to find exactly what you want. Le Sereno in Grand Cul de Sac is newly renovated and beautiful, tucked into a secluded beach that offers water sports. There are no direct flights to St. Barts. You fly into St. Maarten's Princess Juliana International Airport (SXM), then steel yourself for the eight-person propeller jet that flies over a cliff into the tiny Gustaf III Airport (SBH) runway that might be half a city block long. Even if you're afraid of heights, try to keep your eyes open on the descent. Do rent a car! You can book one at the airport. Ask for a Smart car and a similarly small car; it's the best way to navigate the steep, winding roads that weave around the mountainous island. The views at every point are too unbelievable to describe. Maps are extremely easy to follow, as there is basically only one road on the island. I have zero sense of direction, and even I don't get lost. The high season starts with the Christmas holiday and continues through March. Those looking for a packed party scene (think NYC, LA, and Hamptons during the summer) go between Christmas and New Year's. If you are watching your budget, book a trip during the two to three weeks before Christmas. We're not talking bargains, but it's more doable. A note to sun worshippers: The sun is very strong in St. Barts. I learned that the hard way. I strongly advise you to wear sunscreen from head to toe. Institut Esthederm is hands-down the best sun care out there. It's French, so you'll be able to find it on the island.